Super Change VLT is a new generation coin/banknote money change machine able to handle coins, banknotes, TITO and prepaid cards. Super Change VLT accepts and dispenses coins and banknotes plus barcode tickets. It can handle three different kinds of coins by counting, validating and dividing them at a speed of 20 coins a second for a capacity of up to 10,000 pieces. It has a CashCode banknote recycling system able to recycle up to three different denominations of notes in three different cassettes. Each cassette has a capacity of 100 pieces (in total, 300 pieces in recycler) and the stacker can contain up to 1000 banknotes. The paying out of banknotes can be supported by three ATM Fujitsu dispensers (1500 banknotes in all). The Super Change VLT machine can accept banknotes to dispense tickets and pay those tickets by using the banknotes in recycle or the additional ones inside the Fujitsu dispensers. Moreover, it has a data access system and can be programmed to different levels thanks to the operator identification. Armoured cabinet with timer opening, operator identification and operating procedure memorisation. The operator can even withdraw money, by choosing both coins and banknotes in whatever denomination. The administrator can even fix a withdrawal limit. Super Change VLT can be used to print cheques in order to pay those wins exceeding the maximum payment limit fixed by the law. The cheques have to be inserted inside the cheque machine and they will be filled in correctly. Furthermore, Super Change VLT has an online connection to handle the device from remote connection or transmission or data receipt from and to the server. A major new addition to the Suzo-Happ family; this former CashCode product enjoys an excellent reputation in banknote recycling. The Bill-to-Bill is available to pay out either two (Bill-to-Bill 200) or three (Bill-to-Bill 300) denominations. Each recycling drum has a capacity of up to 100 notes. A further great benefit – notes are bundled together when paid out of up to twenty at a time. This is particularly important when the customer is to receive a larger number of notes at one time. This coin payout hopper has been designed to the highest standards for reliability and has thus become the standard choice amongst many manufacturers in the industry. The Cube Hopper MK2 is compact in design and has a continuous opto-sensor check for ultimate security. Thus, it can be used in a whole range of applications – gaming, change, parking and vending. The standard 450 coin capacity can be increased to up to 1200 via 2 additional extensions. Customers can choose from a parallel or cctalk interface. For over 30 years, G&D has been the leading global provider of high-performance banknote processing systems. The company’s products and solutions enable highly efficient processes when counting, authenticating, sorting, packing, and shredding banknotes. Modern cash centres face a whole array of challenges. Growing time and cost pressures demand greater efficiency through automation, while new services call for flexible process, further expanding the requirements catalogue. G&D’s BPS C4 has been specifically developed to meet the needs of cash centres in commercial and central banks, cash-in-transit (CIT) companies, casinos, and other areas where intensive use is made of cash. The BPS C4 system optimizes work process, reduces costs, and enhances the productivity of banknote processing. The BPS C4 is a modular and scalable system that can easily be adapted to suit any substrate or process – from paper to polymer, from freshly printed to heavily soiled, from banknotes to casino tickets. Boasting high flexibility, the BPS C4 can be configured with up to 20 output compartments of differing capacities. In a single run, the banknotes are counted, identified, and authenticated, as well as sorted according to denomination, series, orientation, and fitness for circulation. Faced with altered requirements, cash centres can adapt quickly and easily thanks to flexible upgrades. Detection, evaluation, counting, and sorting can all be carried out in one processing step by a single operator. This enables a throughput of up to 40,000 banknotes per hour. 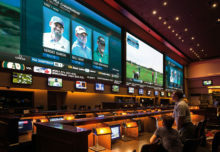 JCM Global has set new standards for casino technology, starting when the company first created the embedded bill validator for slot machines in the early 1990s. Never satisfied with accomplishment and always seeking ways to create even better technologies, JCM kept raising the bar with groundbreaking products like the award-winning WBA and UBA bill validators. The company’s leading product today is more than a bill validator; it is the foundation for intelligent validation. That product is the award-winning iVIZION. iVIZION is the better, faster, smarter solution for the gaming industry, and for good reason. iVIZION’s Contact Image Sensor (CIS) Technology captures the full image of a note or ticket, and its 99%+ acceptance rate is unrivaled. iVIZION has the most diligent counterfeit protection, an RFID ICB cashbox with encrypted and web-enabled data, 64 megabit FLASH memory, a self-calibrating sensor package, modular component design, ability to read barcodes horizontally and vertically, two high-speed processors, sealed 85 mm banknote path, patented and proven removable stacker mechanism, “Blind Mate” and “Hot Swap” design and complete compatibility with all gaming protocols. iVIZION is far and away JCM’s best-selling product around the world. Since JCM first launched the product in 2009, it has been an instant success, winning more than 80 percent of every RFP it has competed for, and has been named the preferred product by OEMs and operators around the world. In the past few months, iVIZION has continued to gain momentum. JCM has been named the preferred bill validator supplier for casinos across Europe, with iVIZION specifically being named the preferred product. iVIZION is also widely used in industries outside of gaming, such as petrol and parking. Within the short time since the ICE Totally Gaming Show, Innovative Technology has received a phenomenal reaction to their revolutionary SMART Ticket product. The SMART Ticket is a unique banknote validator and ticket printer with fan fold or continuous roll ticket media options. The revolutionary combined note in / ticket out design eliminates the need for a separate printer. Add to this the option of top or rear mounting and the SMART Ticket is suitable for multiple applications. Tickets are read and verified prior to issue to ensure the validity of all tickets before issue. The MEI SC Advance note acceptor is Crane Payment Innovations’ leading product for casinos worldwide. It evolved from the winning CASHFLOW SC, redefining the role of note acceptors in the Gaming industry by improving upon the key performance features responsible for operator profitability and customer satisfaction – acceptance, jam rate, security and cost of ownership. Altogether, the SC family of note acceptors has achieved a global installed base of nearly one million units in Gaming alone – a function of its versatility to fit many different applications. A number of modular expansions such as several different cashbox sizes and EASITRAX Soft Count make it possible for CPI to cost-effectively serve an even wider range of markets and accompanying cash management needs with one product line. The new SCR note recycler is the latest addition to the SC portfolio of products. It combines the performance and reliability of SC Advance technology with the benefits of note recycling as part of a total cash management solution. As a single closed-loop system, the SCR accepts, accounts for and stores cash from one player to give as change to the next. This allows operators to pay out winnings completely and securely without worrying about hopper starvation. And by holding up to 60 notes on each of its two recycling drums, the SCR provides the capacity required for longer machine uptime, less cash float needed on site and, ultimately, lower operating costs. What makes the SCR unique amongst note recyclers are its security features. Its architecture includes a removable anti-stringing mechanism, as well as a specialized inventory management system that accurately tracks the number of notes going into and out of the machine. It even provides complete note accountability when powered down. And access to system components, when needed for maintenance, can be done without providing access to secured notes. Novomatic is currently integrating the SCR into its new Giga Star cabinet. After that, it will enter beta test in the German AWP market with the goal of being available for sale around the New Year.